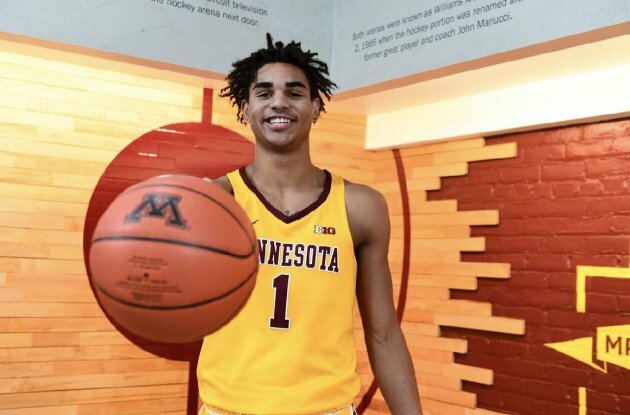 Wasatch Academy (Utah) three-star wing Tre' Williams committed to the Gophers on Tuesday night -- and he plans to ink his letter of intent at the start of the early signing period Wednesday. Williams, a 6-foot-5 native of Colony, Texas, was offered a scholarship by Minnesota coach Richard Pitino last weekend during his official visit to campus. The only other official visit Williams took was to Pepperdine on Nov. 3, but he said Northwestern, Georgetown and Virginia Commonwealth were showing late interest as well. Minnesota assistant Rob Jeter reached out to Williams last month, and then Pitino visited Williams at his high school last week to invite him to make an official visit to the Gophers. Williams said his future role with the Gophers will be as an "energy guy who can score" and play multiple positions from combo guard to small forward. He also loves to play aggressive defensively. The Gophers had their first member of the 2019 recruiting class, Sunrise Christian Academy (Kan.) forward Tray Jackson, switch his commitment to Missouri in October. So Williams is expected to fill one of the four scholarships Pitino has available for next season. Before transferring to Wasatch Academy last year, Williams grew up playing basketball in Texas. He attended Colony High School, where his 6-5 older sister, Jade, became a McDonald's All-American and now is a sophomore forward at Duke. Williams was born Marvin III. His father, Marvin Williams Jr., was a three-sport athlete at Princeton in the early 1990s. He stressed the importance of academics to his children, which is evident with his oldest son's 4.11 GPA. The Williams family wasn't only blown away by the new Gophers' facilities, but they also were impressed with the U's business school. Tre' plans to major in business and sports management. "What impressed us the most was them having a plan about the career after basketball," Marvin Jr. said. "They lay the groundwork well in advance, so when that time comes all those things are thought out and are in place. That was a really big highlight." Williams' mother, Kelly, grew up in the Twin Cities, attended and played basketball at Harding high school in St. Paul. Williams' grandmother and uncle on his mom's side live in Texas. "Everybody else is there," Marvin Jr. said about Minnesota. "They're ecstatic about it. Everybody is hitting us up, 'He looks good in a Gophers uniform.' They're excited about the potential."